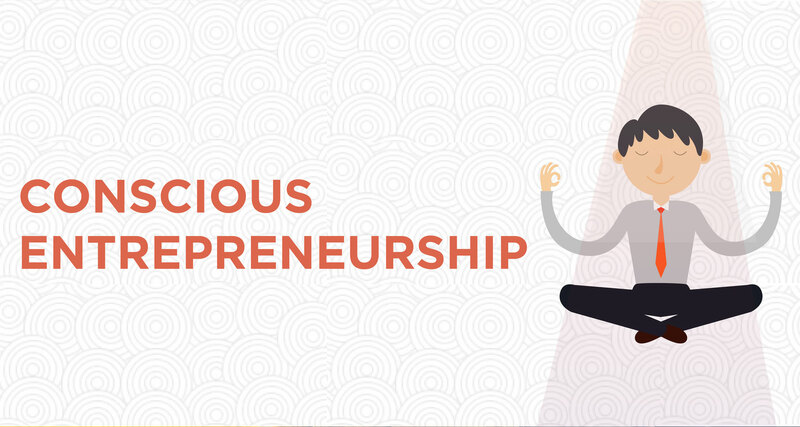 What is Conscious Entrepreneurship (CEP) and it's Benefits? Consciousness is about rising above compulsive emotions, desires, and your ability to harness resources both tangible and intangible. By adopting consciousness, one is able to excel at physical, economic, mental and spiritual aspects of life and is able to produce success in almost every moment of their lives. Entrepreneurship is a human’s ability to harness resources around them in order to produce desired outcomes. These desired outcomes take the shape of tangibility and intangibility. It’s far easier to understand the tangible concept through the five senses. Our senses are the most receptive functions in our body and form a part of tangible resources. According to management studies, tangible resources are defined as men, material, and machines- the three M principle. These principles make up an organization and for the effective functioning of an organization these resources need to be aligned together. Intangible resources are identified as unique for every single human being. These are something never experienced in the same manner. If there are 7 billion people on the planet then everyone experiences it differently. While all experience tangible resources in the same way, intangible resources are experienced differently. Conscious entrepreneurship is about managing every kind of situation in an easier manner. It’s about improving your life every single day and helping people improve their lives as well. Thus leading to a sustained growth forever. It helps us break that bell curve that the world of economics has accepted which in turn has made us believe that there is a bell curve in life. It is about scaling up in life that helps to live life in a sustained manner. It should be such a manner that doesn’t give us stress or anxiety and instead enables us to harness the best out of us. Conscious entrepreneurship makes you attain the feeling of happiness and then you no longer run after it. You learn not to run after the destination and instead enjoy the journey. As humans we are prejudiced about certain kinds of people, consciousness enables us to accept people as they are without any biases. Emotions affect the lives of a human in different ways. When something doesn’t happen according to us there is a certain emotion we produce. When somebody doesn’t say something that we want to hear, there is a different emotion we produce. These emotions are produced instantly on the basis of situations and are like reactions. If I don’t like something there is an instant reaction that will be produced. The reactions are a result of desires. For example- When we have greed, we have a desire to hoard, similarly when we have fear we desire protection, when we face rejection, we desire fame and popularity. All these arise as a result of these excessive desires which in turn makes us more ruthless in life. Every reaction is a result of the cause and effect. When we have uncertainty we desire certainty. When we have comparison we go into competition. Because all our desires are coming out of something that is not ours. A healthy competition turns into an unhealthy competition as soon as we get into comparison. In order to be able to harness our potential and produce desired results, we need to effectively utilize the resources that are given to us. Conscious entrepreneur desires to create something not take something. They feel a sense of purpose with everything that they do, it gives them a reason and motivation to live their lives. It also helps attain confidence in moving forward and allows you to feel supported, no matter what circumstances life may bring. Becoming a conscious entrepreneur CEP is really about finding the satisfaction in what you are doing beyond the money and the accolades. As a conscious entrepreneur, you don’t change people, you start embracing people and once that engagement happens with people around only best comes out. The best is what comes out of both the leader and the people around. Being able to lead a life that is worthwhile for both the leader and the people around is what conscious entrepreneurship constitutes. SKC World is India’s largest Business Coaching Firm in Delhi. We provide high-quality and low-cost services by certified coaches in Delhi.